Pembroke Welsh Corgis: What's Good About 'Em? What's Bad About 'Em? Pembroke Welsh Corgis: the most honest dog breed review you'll ever find about Pembroke Welsh Corgi temperament, personality, and behavior. Spirited and athletic, steady and dependable, the Pembroke Welsh Corgi is a true "big dog on short legs." Herding, obedience, agility, or chasing balls (with surprising speed) are enjoyable outlets for his enthusiasm and desire to work. Corgis are smart dogs who need something to do. If his days include such moderate exercise, along with the loving companionship of his family, the Pembroke Welsh Corgi is adaptable and easy to live with. He is polite with guests, reserved with strangers, and makes an alert watchdog. Often too alert – Corgis can be serious barkers. Most Pembroke Welsh Corgis are fine with other family pets. But they're often territorial with strange dogs and cats – as a working farm dog, one of his responsibilities was to chase strays away from his own farm. Corgis are wonderful with livestock, including horses. This attentive breed learns quickly and responds well to obedience training – better than his close cousin, the Cardigan Welsh Corgi. Yet he has the independent judgment and problem-solving abilities of a true herding breed, so you must have the confidence to establish and consistently enforce rules, or he may make up his own. A Pembroke Welsh Corgi may be right for you. A Pembroke Welsh Corgi may not be right for you. You can avoid some negative traits by choosing an ADULT dog from an animal shelter or rescue group. With an adult dog, you can easily see what you're getting, and plenty of adult Pembroke Welsh Corgis have already proven themselves not to have negative characteristics. Finally, you can avoid some negative traits by training your Pembroke Welsh Corgi to respect you and by following the 11-step care program in my book, 11 Things You Must Do Right To Keep Your Dog Healthy and Happy. Providing enough physical – and mental – exercise. 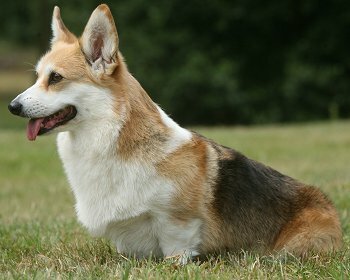 With their short legs and long body, Pembroke Welsh Corgis don't need or want miles of running exercise. But they must have several daily walks and a fenced yard in which to stretch their legs and romp. Just as important as physical exercise is mental exercise, which means interesting activities to do. Corgis are intelligent herding dogs who like to keep busy. I recommend that you get your Pembroke Welsh Corgi involved in regular obedience classes (beyond the beginners level – join a dog club and go every week). Also consider agility classes (an obstacle course for dogs) or even herding, if there is a herding club in your area. Also consider my book, Teach Your Dog 100 English Words, because teaching your dog words and games stimulates his brain and keeps him happy! Chasing other animals. As a farm dog, one of a Corgi's responsibilities was to drive away strange dogs from his own farm and flock. Accordingly, many Pembroke Welsh Corgis can be a bit pushy toward dogs and cats they don't know. Mind of their own. Pembroke Welsh Corgis are smart, but they do have an independent mind of their own (as do most herding breeds) and are not pushovers to raise and train. They can be manipulative or willful. You must show them, through absolute consistency, that you mean what you say. To teach your Corgi to listen to you, "Respect Training" is mandatory. Read more about Pembroke Welsh Corgi Training. Barking. Corgis drove large cattle by barking, darting in beneath their kicks, and nipping them on the heels. So it's no surprise that barking is an inherited trait. If you have close neighbors, you mustn't leave a Corgi outside, unsupervised. He will drive your neighbors crazy. To make matters worse, some Corgis have an intense, high-pitched bark that can set your teeth on edge. Heavy shedding. Pembroke Welsh Corgis shed a lot. You'll find hair all over your clothing and furnishings. Be sure you don't mind vacuuming!